Fall colors on the dinner table! Bring an 8 quart pot of water to a boil. Add kale and cook for 3 minutes. Drain and set aside to cool. When kale is cool enough to handle, squeeze out excess water, coarsely chop and set aside. In a 5 quart saucepan, heat broth and 1 cup water over medium heat until simmering. Keep warm. In 8 quart pot, heat oil over medium heat. Add onion and cook, stirring for 3 minutes. Add barley and cook, stirring for 1 minute. Add wine, stirring constantly, until wine has evaporated. Add 1/2 cup warm broth from medium saucepan and stir until most of the liquid has been absorbed. Add squash. Continue stirring and adding broth, 1/2 cup at a time waiting until liquid has been absorbed between additions. 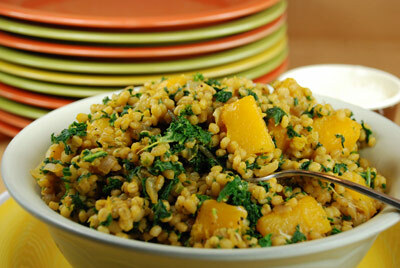 Continue process until barley is tender and creamy yet still firm, about 40 to 45 minutes. Add reserved kale stirring continuously until heated through, about 1 minute. Remove from heat and season with salt and pepper. Serve garnished with grated Parmesan cheese. The risotto will keep, covered, in the refrigerator for up to 2 days. Add a little broth or water and gently reheat. Save $3.00 on TWO Mr. Clean Clean Freak Products (excludes trial/travel size). Void if altered, copied, sold, purchased, transferred, exchanged or where prohibited or restricted by law. One coupon per purchase of specified product(s). Good only in USA, APOs FPOs. CONSUMER: No other coupon may be used with this coupon. Consumer pays any sales tax. RETAILER: General Mills will reimburse you the face value of this coupon plus handling if submitted in compliance with our redemption policy. Copy available upon request. Cash value 1/100 cent. Send to GENERAL MILLS 8, NCH Marketing Services, P.O. Box 880001, El Paso TX 88588-0001 or an authorized clearinghouse.